This short airplane tour is perfect for those wanting to see the vastness of the Canyon without breaking their budget, or for those who have just an hour of their sightseeing time available. 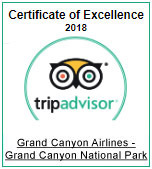 With hourly departures from the Grand Canyon National Park Airport, you’ll board an airplane and head straight for the eastern part of Grand Canyon and cross over the gorge at Zuni Point Pass, placing both the Painted Desert and the Navajo Indian Reservation on display to the east of the Colorado River. The airplane's direction will then change course and fly over the rugged wilderness of the North Rim. Additional sights include the Kaibab Plateau and lush greenery of the Kaibab National Forest. Keep an eye out for wildlife including the California condor, elk, and even bears! Marvel at the massive rock walls and the Colorado River nearly a mile below the rim. Enjoy additional sights of the Kaibab National Forest, Confluence of the Little Colorado River, Imperial Point, and Zuni Corridor.